BETA MAX TV DIGS GRAVES – PETER GRAVES, THAT IS!!! Peter Graves (nee – Peter Duesler Aurness) was born March 18, 1926 in Minneapolis, Minnesota. Interested in music and athletics, he became a radio announcer before spending 2 years in the Air Force in WWII and studying drama at the University of Minnesota. Bitten by the acting bug like his brother James Arness, he headed to Hollywood to start his long and varied acting career. Today, we at Beta Max TV celebrate the birthday, life and career of Peter Graves with two of his early works. In 1955, Graves landed the role of Jim Newton, owner of the Broken Wheel Ranch in the television series FURY. Running for 116 episodes, it was the story of Fury, King of the Wild Stallions and young Joey, the only one who could ride Fury. In this episode, FURY RUNS TO WIN (1956), the man who holds the mortgage on the ranch forces young Joey to enter his horse Fury in a winner-take-all-race and the winner gets Fury and the ranch. 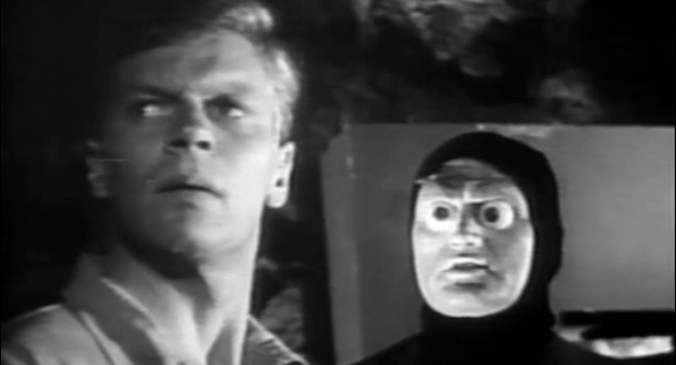 Before Peter Graves was a ranch owner, he was a nuclear scientist and had a run-in with some bug-eyed aliens in KILLERS FROM SPACE (1954). Doc Martin (Graves) crashes while flying over an atomic test site and is presumed dead. But shortly afterward, he turns up alive, sporting a huge and mysterious scar on his chest and a story of alien invaders who plan to conquer Earth using giant insects..
Our “mission” here is definitely not “impossible” – celebrate Peter Graves’ birthday with your place for B-movies…and more! Beta Max TV!!! ← MAD MONSTERS AND MORE ON BEWARE THEATER!! !